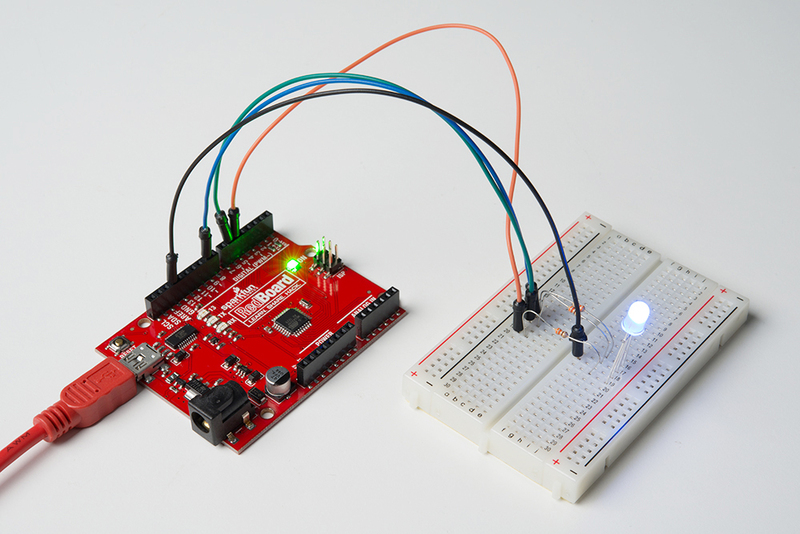 In Experiment 3 you used an RGB LED to create a rainbow of fun. The problem is that, to define colors, you had to change your Arduino code. 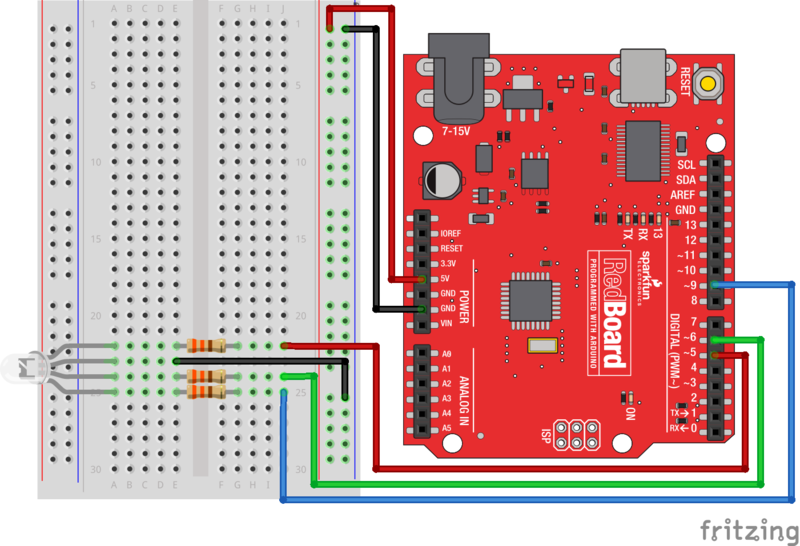 You have also used the Serial object in Arduino to print out data to your computer using Serial.print(); and Serial.println(). In this experiment you will send serial data the other direction -- to the RedBoard! What data will you be sending? Comma-separated RGB values to change the color of your RGB, of course! Let's see what pot of gold lies on the other end of this data rainbow! the RGB values of the RGB LED. //create variables for pin numbers. We are making them constants here, because they       //never change. Whether you are using serial communication as an input or an output, you need to use the begin() method to start your serial port. The baud rate can vary, but 9600 is the standard for most applications. There are a number of ways to read and parse data coming in from the serial port. The simplest way is to format your data coming in as a Comma-Separated Value (CSV) string. In this format the parseInt() method captures the data as it comes in. Once the there is a non alpha-numeric character (a character that is not a letter or a number) parseInt() will stop capturing the value as an integer. As an example if we were to send the string 123,456,789 through parseInt() it would return the value of 123 because it would stop capturing at the comma (,). In this experiment we use the parseInt() method three times, one right after the other, to capture the three comma-separated RGB values and place them in the three color variables. You should see nothing at first when your upload is complete. Open up the Serial Monitor (The magnifying glass icon in the upper right-hand corner of the Arduino IDE). You should see the text "Please enter your RGB in CSV format(Example: 255,100,0)" print out in the serial monitor. Enter an RGB value, (we are using 255,100,0 as an example) in the text entry area as shown below and click 'Send'. Once you click the send button your RGB should turn a purple color. Congrats! You just sent data to your RedBoard from your computer! With the four pins of the LED so close together, it’s sometimes easy to misplace one. Double check each pin is where it should be. Make sure you are sending your data as integers between 0 and 255 in a comma-separated format.